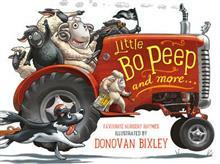 "Hop on board for a hay ride of fun, with four favourite sheepish nursery rhymes." --Back cover. Hop on board for a hay ride of fun, with four favourite sheepish nursery rhymes. Fun for the kids -- and fun for the adults! Donovan Bixley has written and/or illustrated over 100 books and won many awards, including the 2014 NZ Post Book Awards coveted Overall Children's Choice Award. Donovan illustrated the bestselling children's books The Wheels on the Bus (2010) and Old Macdonald's Farm (2011).